Tameka Jennings, clinical assistant professor of biological sciences, is pictured with students from the Biomedical Girls Research Camp. 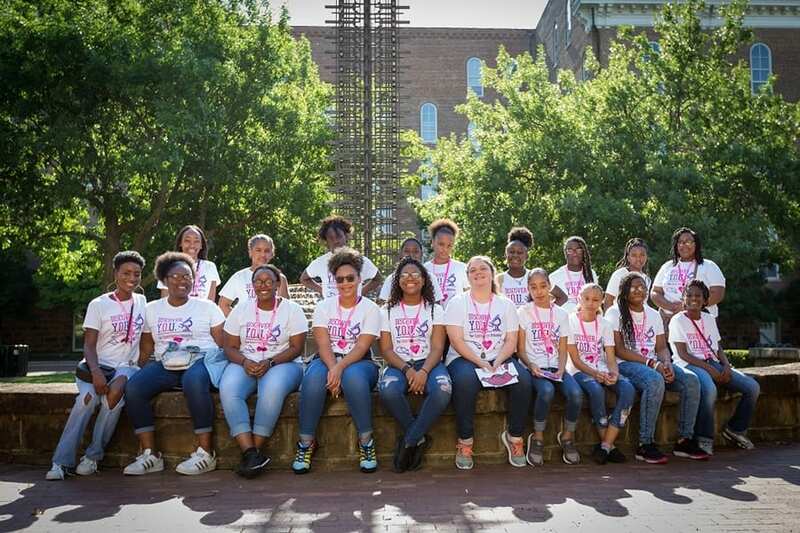 Eighteen girls from Dumas and Gould made the trip to the University of Arkansas over the summer for a hands-on look at the world of biomedicine, including the fields of biological science, biomedical engineering, exercise science and more. 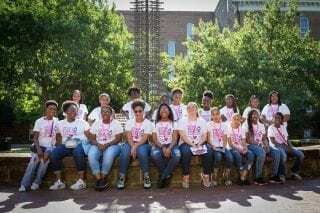 The program, called Biomedical Research Girls Camp, is aimed at building diversity among students who pursue science, technology, engineering and math career paths. The camp is in its third year, and this year featured a wide range of collaborators across campus, including the College of Engineering, the J. William Fulbright College of Arts and Sciences, the College of Education and Health Professions, Razorback Athletics, the Center for Multicultural and Diversity Education, the Office of Undergraduate Admissions and the Office for Diversity and Inclusion. The camp was started by Tameka Jennings, a clinical assistant professor of biological sciences in the Fulbright College. For Jennings, who is from Gould, the camp is a chance to forge a meaningful connection with her hometown. “There is so much pride in Gould and Dumas,” she said. “I am a native of Gould, and I love my community. I have dreamed of creating this camp since I was in high school — this camp is my dream realized. Tyrone Washington, associate professor of exercise science, leads campers through an exercise physiology lab. Campers visited several University of Arkansas research spaces for a look at the wide field of biomedicine. The experience was more than simply looking around — campers had an opportunity to conduct their own experiments thanks to volunteers from biological engineering, biological sciences and exercise science. Students visited the Engineering Research Center at the Arkansas Technology Park and dissected a pig heart, examined a frog’s nervous system and participated in exercise physiology labs, among other activities. “In addition to the biomedical engineering heart lab and Engineering Research Center tour, the students got a broad scope of biomedical research,” Jennings said. Topics included embryology, the nervous system, neurology, medical microbiology, epidemiology, environmental science, oncology and cardiology, all accompanied by experiments and other activities to give campers a hands-on look into those fields. 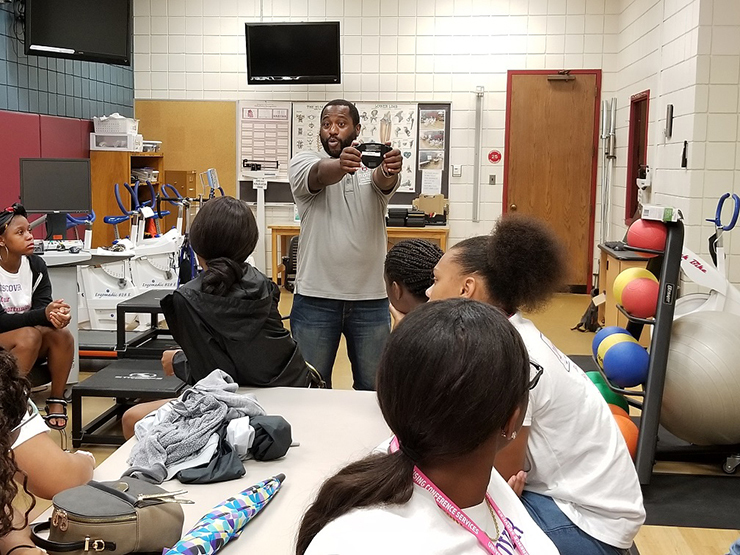 Tyrone Washington, associate professor of exercise science, led the campers through exercise physiology labs. Washington said the camp was important to him for several reasons. “For one, it exposes young black women to the wonders of science in a way that is fun and engaging,” he said. “Second, this camp helps these young women understand that the University of Arkansas is a place that is for them. 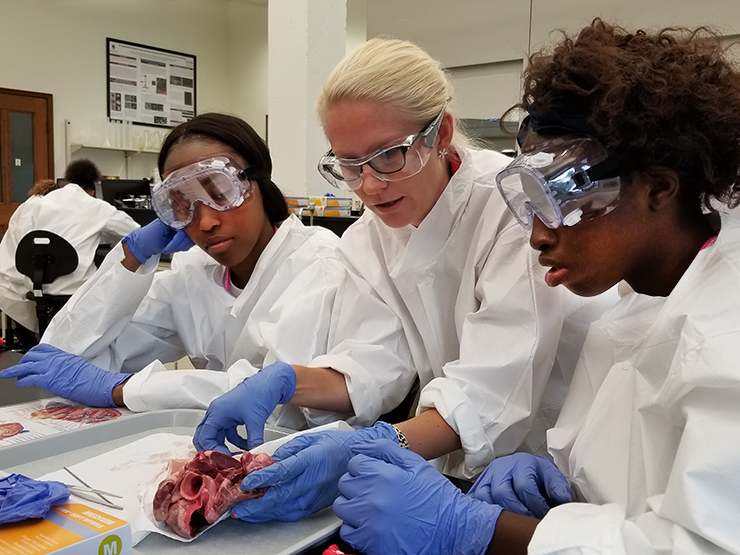 Hanna Jensen, clinical assistant professor of biomedical engineering, leads campers in dissecting a pig heart as an introduction to cardiovascular physiology. Hanna Jensen, clinical assistant professor of biomedical engineering, led campers in dissecting a pig heart as an introduction to cardiovascular physiology. She said the camp is an opportunity for campers and volunteers alike. Jennings said that was the message she hoped to send back to Southeast Arkansas. “I want them to feel that we are there because we know that they are the next generation of STEM and biomedicine professionals,” she said. Funding for the camp was provided by the Department of Biomedical Engineering, the Department of Biological Sciences and the Office for Diversity and Inclusion.